World popular sand artist Sudarsan Pattnaik's students have created a sand art on Puri beach on the occasion of Odisha Day. The artwork represents the different culture and traditions of the state on its formation day. From the representation of an Odyssey dancer to the famous Jagannath Temple, the sand art covers Odisha's peculiarities. Odisha Day is observed on the day of its formation as a separate province on April 1, 1936. The day is also known as Utkala Divasa and Utkala Utsava in Odisha. 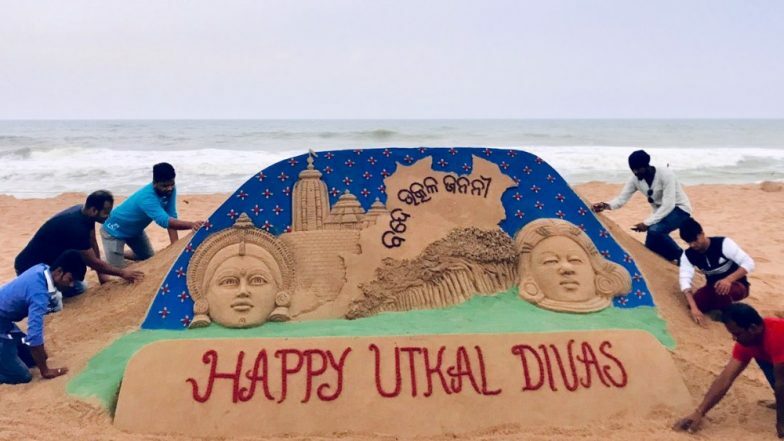 Sudarsan tweeted pictures of the sand art saying, "Occasion of #UtkalDiwas my students have created a sand art with message #VandeUtkalJanani at Puri beach." Odisha toiled for three decades which finally led to the foundation of a separate Odisha Province. It was formed under the leadership of several leaders along with public support who demanded a separate state. Utkala Dibasa Greetings by Narendra Modi; PM Wishes People of Odisha on State's Formation Day. People of Odisha celebrate this day by organising various events remembering the works of leaders due to Odisha was formed. Wide display of fireworks is quite popular on this day. Various cultural programs highlighting the customs and traditions of the state are also observed on Odisha Day. Meanwhile, people of Odisha have taken to Twitter wishing #UtkalDiwas and #VandeUtkalJanani. Various competitions are also arranged on this day depicting the culture of the state. The Parliament of India renamed Orissa as Odisha on November 9, 2010. Simultaneously, the Oriya language was renamed as Odia.